Mother Earth eased up on us this weekend and provided some lovely 50+ degree temperatures; that's enough to make me run skipping out of my cave of hibernation. There is only one thing better than spring and that's summer. Bring it on!!! Yesterday was one of the best Saturdays we've had in a long time. After Hannah woke up from her afternoon/after swim class nap, we broke out our new used stroller (found this $190 stroller for $50 on Craig's List) and tried it out on a short walk to the library to pick up my book club book. Love it!! This stroller is super light and takes up very little space. I'm a big fan. Today was an even nicer day for a walk so we decided to try out another new toy: the baby carrying backpack that Joel bought Eric for Christmas (sort of like this one but black). Another awesome mode of transportation for her. Eric said it was super comfortable and Hannah seemed to love the vantage point. Thanks Joel! Watch out for bears (in backpacks)! Ack! Bears that transform into reindeers! Double ACK!!!! As I was uploading pics, Hannah woke up from her nap. Since she was squealing with delight, I had no qualms about leaving her in her crib, but after a few more squeals I decided to check the video monitor to see what she was up to. 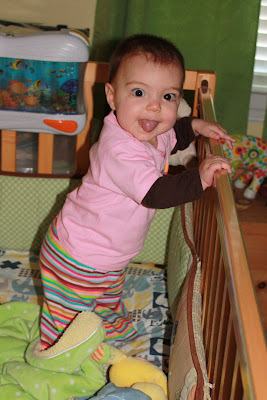 WELL, it's a good thing we lowered the crib last week because she managed to pull herself into a FULL STANDING position and was standing there squealing at the cat who sleeps at the foot of the big bed that we keep in the nursery. Full standing! I grabbed the camera and ran upstairs. Oh yeah, I have a couple of cute ones of her in that outfit too. I was going to save them for later this week but since this turned into another everything-but-the-kitchen-sink post, I'll just throw 'em up now. So yeah, it was a pretty fun/relaxing/awesome weekend! I used to put you in the backpack all the time - but you would kick off your shoes and I'd have to backtrack. Love the pictures! Where did you guys hike? Hannah looks happy all the time. Little sweetie. We did bicycle backpacking a lot :)(seats on the back of our bikes). The boys loved it. Well, next she will be climbing OUT of the bed. So glad we can see her firsts by video and pictures, since we can't be there. ...and it looks as though her nose scrunch is going to be her signiture smile. HAH! I hope so! It's a great signature to keep! L O V E THE Pics...... She is a doll baby!!! !